Hacienda del Sol rests on the shore of the beautiful Sea of Cortez with miles of white sand beaches, diverse sea life and spacious tranquil surroundings. 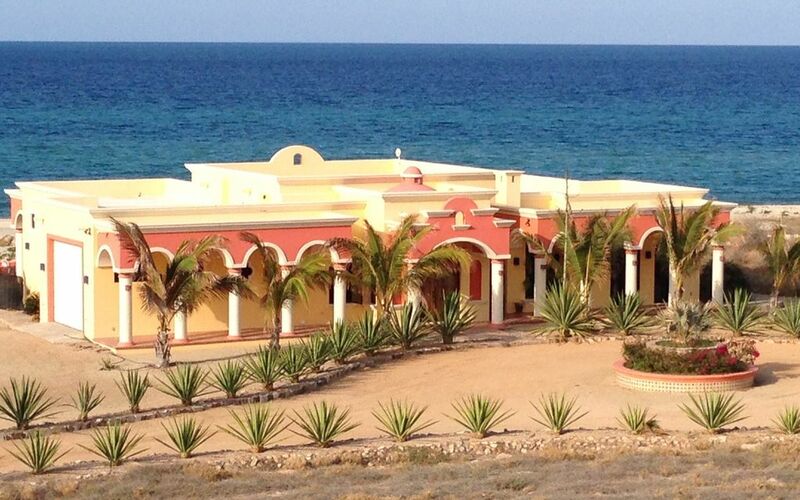 The Hacienda is located just outside of La Ribera, a quaint traditional Mexican fishing village, an hour’s drive north of the Los Cabos airport. This is the ideal location for a relaxing vacation, away from the fast pace of everyday life. La Ribera is home to a number of small family run restaurants, grocery stores and shops. The local people are very friendly and helpful. Working with an award winning architect and builder, Hacienda del Sol was created to reflect the finest in authentic Mexican style, which is apparent throughout the house. The Hacienda has been created with comfort and convenience in mind with traditional architecture, Mexican finishes, such as specially selected Talavera tile and a spacious interior that opens out to a large veranda and welcoming pool. The two master suites have luxurious king size beds with perfect views of the Sea of Cortez through the expansive sliding glass doors. Each bedroom has a large adjoining bathroom that has a walk in shower with a bench, as well as a double vanity. The sliding glass doors can be left open at night, allowing you to fall asleep to the gentle sound of the lapping waves. The third bedroom has two queen size beds and a large walk-in closet. This bedroom also has views of the Sea of Cortez with its own sliding glass door and small private patio. The adjoining bathroom has a double vanity and large walk in shower with a bench. The large central great room is perfect for gathering at any time during the day. The seating area provides for easy conversation and there is a television and DVD player with a large variety of movies. The professional, chef designed kitchen is spacious and comfortable, allowing guests to gather during food preparation and dining, as there is island seating for six. Another special feature is the large traditional Hacienda style dining table. The veranda spans one entire side of the house, with a fantastic view of the Sea of Cortez. This is where the pool and gas fire-pit are located, where you can spend many relaxing hours during the day and night. A sun sheltered outdoor dining area is another option for enjoying the tranquility of Hacienda del Sol. If you enjoy cooking on the BBQ, there is a large outdoor gas grill only steps away from the kitchen. The Cabo Pulmo National Marine Park with its spectacular living coral reef and abundant marine life is located 16 miles south of La Ribera. There is a small village with facilities that can set up dive tours, and provide diving or snorkeling equipment if you do not have your own. There are also a few small restaurants in Cabo Pulmo. Twenty five miles north of La Ribera is the tourist town of Los Barriles where wind surfing and sailing are popular sports. There are restaurants, shops and hotels, as well as a larger grocery store. Live music and art festivals can occur during the tourist season. The Sea of Cortez is one of the best bodies of water for fishing in the world. Locals and tourists alike love to seek out theRooster Fish from the shore and have named the coastline 'Rooster Fish Alley'. Sierra, Dorado, Marlin, Red Snapper and Tuna are a few other species that are popular with the fishing crowd. If you prefer, arrangements can be made for a panga boat to pick you up directly in front of the hacienda for a day of fishing. Charter boats are also available for hire for deep sea fishing. Hacienda del Sol is a unique accommodation located in a safe part of Mexico and we look forward to sharing the experience with you! We've traveled in Baja for many years as it is one of our favorite places to visit. We have always loved what the small towns in Baja have to offer; quiet and relaxing environment, beautiful coastline and the rugged desert. We purchased the property in 2011 and construction was complete in November of 2012. During this process, we became great friends with our architect and builder, and other locals, and are thrilled to be apart of such a great community. The Sea of Cortez has been apart of our lives for many years and we wanted it to become 'home' for our family. The quiet and tranquility of this small fishing village was alluring to us. Help yourself to items in the pantry and please replace before departing. Outdoor dining area seats 8. Our second time back and Hacienda Del Sol has everything to provide for a beautiful reflaxing stay for two families and our young kids. We’re so glad you enjoyed your return trip to Hacienda del Sol with your family and friends. Thank you so much and please let us know when you plan to return to Baja! Hilary’s home is beautiful and was the perfect place to stay during our week long vacation. Beds were comfortable, every amenity was there and the pool was the icing on the cake. Ramon, the gentleman that checked in on us was great and very responsive when needed. I highly recommend staying at Hacienda Del Sol and I’m already ready to go back myself. Thank you for sharing your comments regarding your recent stay at Hacienda del Sol. We are so glad you enjoyed your stay! Best Regards to you and your family! Incredible beach retreat away from it all. We couldn’t have asked for a more amazing experience staying at Hacienda Del Sol! We celebrated my husband’s birthday there, and we can’t wait to go back! While the pictures shown in VRBO are beautiful, they just don’t do the house justice. It’s more amazing than we could have imagined. The home is just stunning. As you drive up, you get hit by that “WOW” factor, and that doesn’t really stop the entire time you’re there. The house is gorgeous, inside and out, and manages the perfect balance between modern luxury and rustic charm. Everything is very generously appointed- they even have sharp knives and good toilet paper (hey, sometimes it’s the little things, right?). The back patio and pool area are more spacious than they appear in the pictures, and it is beyond serene to float in the pool while listening to the waves crash just yards away. The first night we went to eat at Las Cabañas Restaurant about 5 mins away- only so-so food. Maybe that’s just in comparison to the groundskeeper Ramon’s cooking, which we had the rest of our stay. It was spectacular! Highly recommend the chili relleños and tortilla soup, but everything was delish and only $20pp. Next time we’ll check out Effrin’s Restaurant which has an awesome view. We rented the neighbor’s ATVs for the whole stay, which were an absolute blast, and allowed us to see a lot more of the area. Kind of spendy, but worth it! The beach was sandy and perfect for swimming. Calm enough to easily get in the water, and shallow enough to swim and float around without a care. Can’t say enough about our experience at Hacienda Del Sol, and the owner was wonderful. Great communication before and after, and she even touched base with us while we were there to make sure everything was going well. Only downside was not being able to stay longer, but we will definitely be back! We are so glad that you enjoyed a wonderful birthday celebration with your husband at Hacienda del Sol. Thank you so much for taking the time to share your detailed comments about your stay! Enjoy the rest of your summer and we'll look forward to hearing from you with regard to a future stay. You couldn’t ask for a better location! This house was perfect for our family of 5. Very comfortable beds, and all of the amenities you need for a quiet getaway. The owner and caretakers take very good of this property. The caretakers wife prepared dinner for us twice and the meals were delicious. Access to the beach for fishing, snorkeling, paddle boarding and walking was perfect. Town was just a short ATV ride away, but larger grocery shopping was better done on arrival at SJD and Los Barriles also had a great store. The kitchen was well equipped. The patio and pool were fantastic. The pool was just the right size. This is a remote location, very peaceful and relaxing. You can hear the waves from the patio and master bedrooms, especially on windy days. WiFi worked great to stream music. We felt very safe here, everyone in town was friendly and helpful. Great wildlife and birds to watch every day. Wish we were there now! Thank you Hilary!! We are so glad that you enjoyed your stay at the hacienda. Thank you for taking the time to share your comments! Beautiful, well appointed home with lots of room right on the sea. Perfect beach for long walks; clean and hardly any other people. Quite isolated, requiring driving to small towns, markets and restaurants. Local food was excellent! Property manager was very helpful for any questions and concerns. We enjoyed the experience very much. Thank you for your comments. We are so glad that you were able to enjoy Hacienda del Sol and the east cape for a nice long winter stay. We hope to have you as guests in the future. From the very beginning Hilary was amazing. She responded quickly to my request to rent her home. Then proceeded to amaze me with over the top helpfulness. If you have never been to this part of baja it is absolutely beautiful and amazing but it is well off the beaten path. One is not always afforded every luxury that you may have in cabo san lucas But with Hilary's help she was able to help find us every thing we could have ever wanted and needed . She first made sure I knew exactly how to arrive at the hacienda ( maybe a lil item but this Baja doesn't always have roads. nor does it have signs to make sure you make it and forget about ways or google maps these roads don't exist ). She then help coordinate dinner for our group on our arrival night which was such a treat. Menu had anything we could have asked for and was prepared deliciously ! The Hacienda it self was exactly what we had hoped for , A beautiful open hacienda footsteps to a nearly secluded beach. Inside the rooms where spacious. well kept and had the most beautiful Mexican tile work. Beds where comfortable. kitchen had anything and everything to make a meal . outside area was built perfectly to pay tribute to the beautiful sea of cortez. I honestly have never had such luck with VRBO . I will most certainly visit this hacienda again . Thank you so much for your kind words! It was a pleasure working with you, and I am so glad you enjoyed your stay. Please let me know when you plan on returning to Baja, as we would gladly open our home to you once again.